I realised that having children means that you sacrifice a few things. Hot cups of tea or coffee are replaced with cold cups of tea or coffee. This Morning is replaced with Show Me Show Me. Lay ins are replaced with early starts. And, for me, beautiful jewellery is replaced with bare necks and stud earrings due to grabby babies. So far in the past 3 years I have had 4 necklaces broken by babies. I decided that I will wait until Harry is older and no so grabby until I treat myself to pretty jewellery. Then I had the opportunity to review a piece of jewellery from Four Beautiful Keys. I'd been following Four Beautiful Keys for a while on Twitter and always adored their beautiful jewellery. Rather than turn down the chance to receive one of their pieces I decided to go for it and save the necklace for when I have a date night or for special occasions. I knew I would be receiving a pendant of some kind, and looking through the website I was glad I wasn't given a choice as I wouldn't know what to choose. When the box arrived and I opened up the lid I was delighted to see a Sterling Silver Personalised Heart Pendant, engraved with my sons names on them. 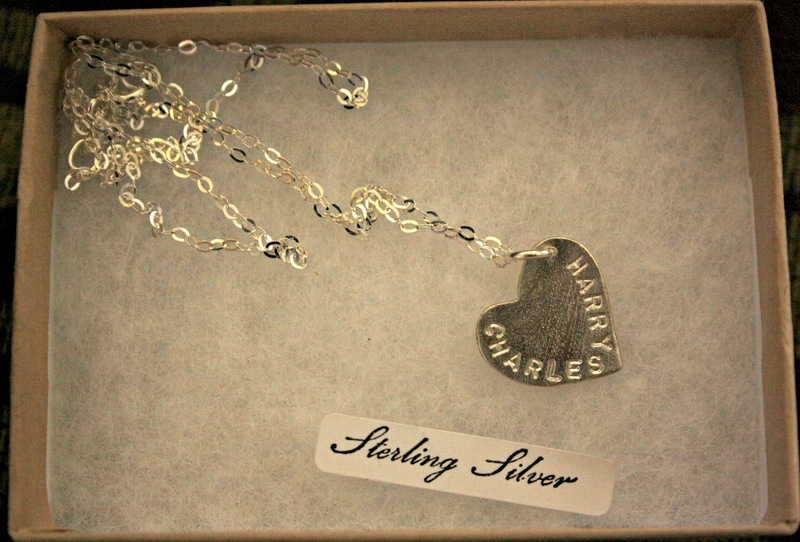 I burst into tears (happy tears) because of just how beautiful the necklace is. The necklace is so danty yet the text on the heart is very clear. I find that with some engraved items it can be difficult to read the text but in this case it is very clear. The chain is delicate but strong. 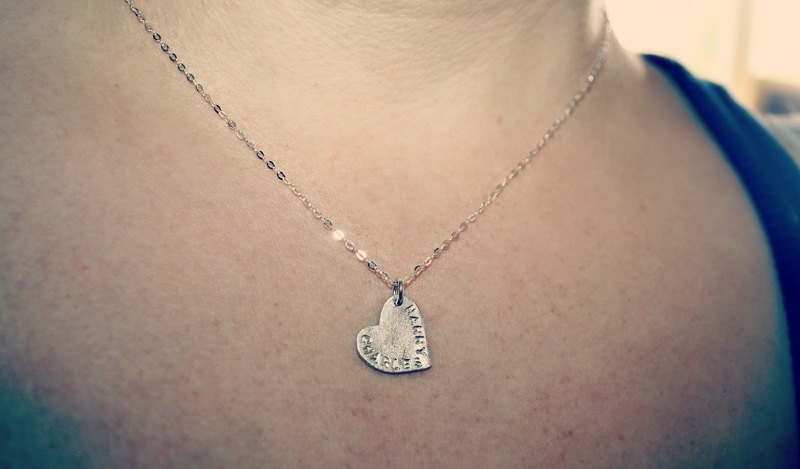 I love that the chain is pretty and compliments the heart perfectly. It's super shiny and glistens in the sunshine. Being a stay at home mum its easy to fall into the loop of dressing slummy everyday. Tracksuit bottoms, vest top, no real effort seeing as every item of clothing will ultimately end up covered in food, sick or similar. I try to make an effort sometimes, even if just staying at home, as I think it can really change the way you see yourself. I regularly refer to myself as "JUST" a stay at home mum, putting no real confidence in myself at all. It's hard to not fade into the background too. I honestly believe that no matter how slummy you are feeling or how slummy you are dressed, a piece of jewellery can seriously pick up your mood and make you feel beautiful. I have shown this necklace to everyone I've seen since it arrived and all have had the same reaction, saying just how amazing it is. I am so in love with this and the fact that it has been engraved with the names of two of the most special people in the world to me makes this piece extra precious. Not only is the piece beautiful but the company themselves were fantastic to work with. I didn't tell them the boys names so for them to take the time to look into my blog and find out about me and my family was a really good personal touch and made me feel. Everything feels so personal and it's nice to know that they clearly care about their products and their customers. I know the place I will be visiting for future birthday and Christmas presents for family now on. Visit their website to view the wide range of stunning jewellery available. My birthday is coming up in September and I'm already looking through the website trying to decide on which items should feature on my birthday list. *I was sent this necklace to review but all words above are honest and my own.